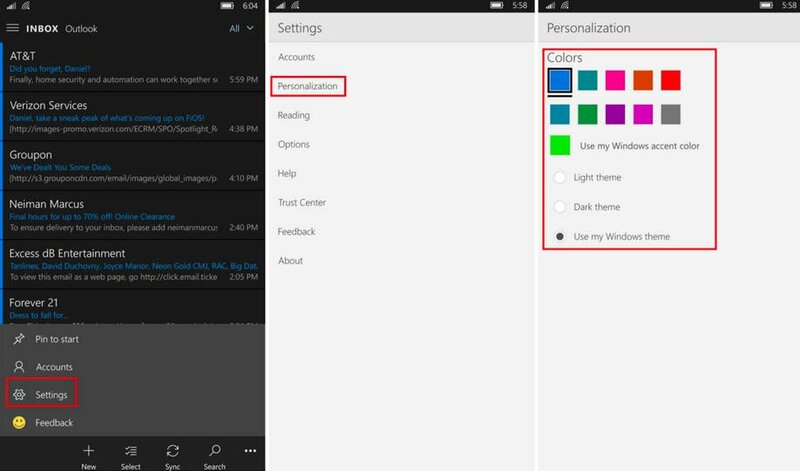 A brand new Dark Theme and some other new features have arrived for the Outlook Mail and Calendar on Windows 10 Mobile. Go ahead and read some more details on this below. According to a fresh report coming from Windows Central, the Outlook and Calendar apps for Windows 10 Mobile have been updated with a bunch of new features. The most important addition is the new ‘Dar Theme’, which has been requested by many users. One of the reasons why you may wanna use a dark theme is when you’re using your device in the dark – the screen’s brightness won’t cause such a big eyestrain. And, other than that, it just has a cool touch to it. The new update also brings changes to the menus and adds a new personalization option, allowing users to change the color of their Windows accents. Furthermore, a few menu styles have been as well, such as as adding a mail account switcher directly into the left menu. At the moment there is still no official date for the Windows 10 Mobile release date, but Microsoft plans to announce a bunch of new devices on October 6th, so maybe there’s a chance for the new OS to make an appearance there, as well. All in all, these are some minor changes, and once the final version of Windows 10 Mobile becomes available, chances are that we’re going to see a much bigger changelog than this time.